When Jeff Ragsdale went through a difficult break-up last year, he found himself isolated and alone in New York City. 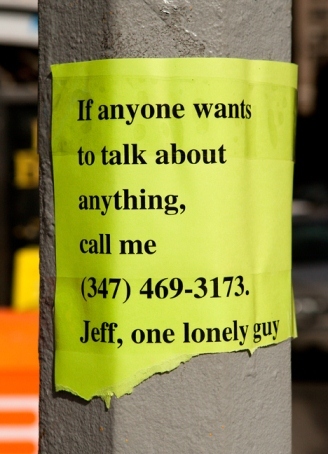 Desperate, he put his phone number on a flier along with a simple message: "If anyone wants to talk about anything, call me." He posted copies all across the city, and waited. The response was overwhelming, with thousands of calls coming from across the US and around the world. Jeff and two collaborators then transcribed the conversations, text messages and voice mails, publishing them in Jeff, One Lonely Guy.